MAKE IT YOURSELF, IT’S EASY! BY YOURSELF, WITH FAMILY OR FRIENDS. * Choose your colours, your brushes, and your accessories. * Paint to your taste; you’re the artist! * Our artistic consultants are there to help you. * Your piece will be glazed and then fired in our kiln. * Couple days later, take it home. * Our ceramic pieces, once they are fired, are microwave and dishwasher safe. * Ask for a visit to our kiln room, where the ceramic is glaze and then fired at around 2000° F, it’s free! 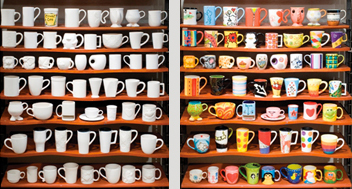 Customers of Ceramic Café can choose from over 2000 different pieces that are available to them: cups, bowls, plates, piggybanks, tea pots, boxes, flower vases, sushi trays, candlestick holders, picture frames, soap dispensers, etc. there is something for all tastes, ages, and budgets! The price of each ceramic piece varies in general between 10$ and 20$. Corresponds to the amount of time it takes you to paint. It includes paints, brushes, accessories, 1001 ideas to trace, glazing and firing of your pieces. If you don’t paint, this fee won’t be charged. 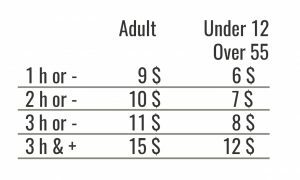 While a child paints, even if they are helped by their parents, only the child studio fee will be charged. When 2 adults or more paint the same and only ceramic piece, a single studio fee will be charged. No extra studio fee if you paint more than one ceramic. Taxes and tips not included.